Home android google mobile playstore tech news uc browser UC Browser Temporarily Removed from the Google PlayStore for "Misleading Ads"
UC Browser Temporarily Removed from the Google PlayStore for "Misleading Ads"
Alibaba owned UC browser has just been temporarily removed from the Google PlayStore. The browser which has over 500million downloads on Google PlayStore is currently the most popular browser on India with over 100 million users surpassing chrome and one of the most popular in the world. 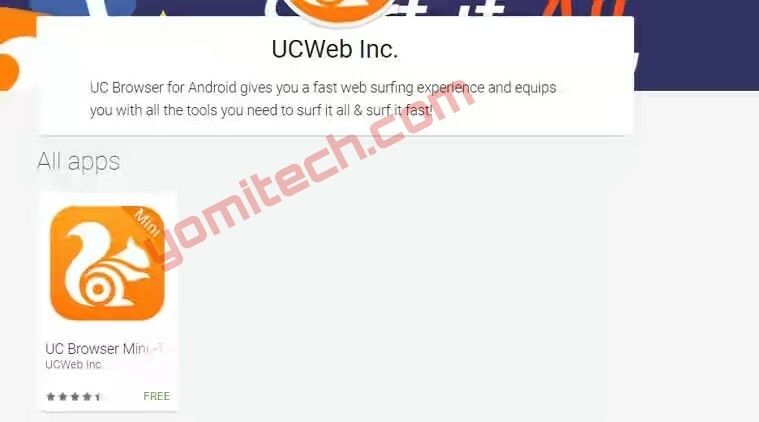 Although there is no official statement yet from Google and UC web on this new development , report has it that the reason for the temporary removal is due to the malicious redirect ads served up by UC Web's affiliates to inflate installs prompted Google to take action and delist the browser. "Dear Partner, We hereby emphasis again that UC Union prohibits any and all misleading/malicious advertising method(s) to procure new users when promoting UC Browser campaigns, such as by using slogan inconsistent with the Product functions, or by using inductive slogan. UC Union is looking forward to cooperating and developing with you in a healthy UC Union ecosphere." "I work for UC Browser,I got mail today morning it said that UC Browser was temporarily removed from play store for 30 days because it used "Misleading" and "Unhealthy" methods of promotion to increase installs"
UC browser gained momentum in India over the last few years for its speed and sheer number of features, which included a robust download manager, customizable add-ons, and integration with third-party services. The app take down appears to be temporary and UC Browser should be back in the store after 30 days. Google is taking a strict stance on apps using dubious tricks to increase install base or spread ad malware to steal user information. Google has also introduced a ‘Verified by Play Protect’ feature, which aims to keep out harmful apps from a user’s phone.